The first day started with incredible rain, so wet we were all soaked by lunch. As the day wore on, the highlands lit up with glorious sunshine for us to pass the 9 locks of Neptunes Staircase to the canal proper. A fast transit meant Bessie Ellen was able to get through Loch Lochy (Had the Scots run out of names when naming this one? )to end the day at Laggan under the emerald hills. Despite a few midges the night was still and the voyage crew relaxed into the roll of handling the ship. Day 2 . Wound our way through the canal and into the mystical Loch Oich(see photo )a day so still the reflections of mountains and water made it hard to navigate. A lunchtime descent at Fort Augustus and across Loch Ness – no monster to be seen anywhere in the hot sunshine. We are enjoying ourselves on the canal and may retire from the sea – so relaxing. Day 3 Inverness and the call of the sea. Out we shot into the moray Firth setting sail passed the bridge the horizon stretched away to the east under clear skies. Bottlenose dolphin and their young joined us to say goodbye to Bessie Ellen. The night passed mostly under sail as the lights of old herring ports twinkled out to Starboard, Macduff, Buckie Portsoy, all quiet in the warm night. By daybreak the wind had increased to 30 knots and steering was pulling the ship to weather so the mizzen and flying jib came down. On she rolled – 8.5 knots ripping along, sweeping past oil rigs, not using a drop of their black blood to move her. At night the structures appear as futuristic cities, vast and imposing, feeding off the earth. Onwards we sailed until the wind died and the vessel became shrouded in fog. Thick fog, so thick the navigation lamps lit up the night, our world became small and tense, looking out for other ships also creeping towards new harbours. With no wind at all the engine was started, places to go, timetables to keep and planes to catch and with 55NM to go the wind just could not fill the sails enough. Day 5 Dawn broke and the fog started to lift creating pastel skies you seem to get in the East. Nothing like an island dawn – still and silent. A low coastline emerged then the chimneys and windmills of Thyboron broke the skyline. Now we were in the land of shallow water and sand, not deep water and rocks of which I am so used to. With voyage crew steering, told to stay inside the channel marks or we will go aground – and no tides here to help you out. The sun was bright now – and hot! All sails were set and the crew tacked up Nissum Breeding and on through the bridge, reaching at 6.0kts towards the high bridge connecting Mors to the mainland. Uneasy with the height of bridge and mast – just doesn’t look 29 M!! the ship falls silent – expecting to touch at any time. Then we are through with a big sigh and headed for Nykobing for the night. Our voyage crew have sailed all day, and as the sun sets our voyage seems to have come to an end although still 14 nm further to our departure destination it seems fitting to relax and remind ourselves of the past week with so many parts. The ship is quite now, all ready for the next band of merry souls – here for racing the Limfjord with a fleet of traditional sails. Here’s to fair winds boy’s! Hazel Southam, freelance journalist, recently voyaged around the Hebrides with us. The National Trust for Scotland has just ended its ‘Love Our Islands’ campaign, which they ran to highlight the importance of the culturally and environmentally protected St. Kilda archipelago, amongst others, whilst raising funds to support the cause. St Kilda is one of our favourite destinations to visit – remote, untamed and breathtakingly beautiful, the islands hold a firm place in our hearts, and the recent campaign struck a chord with us. Although there are no longer any human residents on the islands, there are still houses, churches and other buildings which all need to be protected from the elements of the North Atlantic. However, it is the declining sea bird population which deserves much of the attention. There are over 1 million nesting seabirds on the seven islands of St Kilda, including puffins, gannets and kittiwakes. This is Europe’s largest colony, and a quarter of Britain and Ireland’s breeding Atlantic puffins. Their significance cannot be stressed enough, and recent surveys have reported that the number of these birds are declining, with both the seabirds and their habitat under huge threat from global warming. 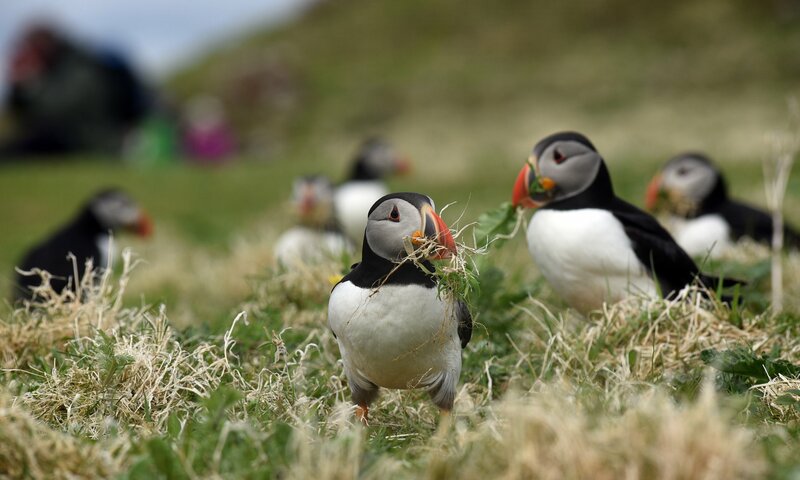 With the National Trust of Scotland already putting in £270,000 a year in order to continue the care that is already taking place on the island, and to be able to use the seabirds as an indicator of global warming, the archipelago needs all of the money it can get. Aboard the Bessie Ellen, we are pleased to announce that for every passenger to come aboard with us on our voyages up to St Kilda, we will donate £5 to the campaign. Given that we travel up to the islands at least once a year, we know first hand how important it is to preserve not just the history of St Kilda, but its environment and wildlife, too. Join us, and visit the beauty of St Kilda before it is too late – however we hope that the National Trust for Scotland’s campaign will be a roaring success, and enable them to keep conserving St Kilda before it gets to the point of no return. If you want to help immediately, rather than wait until next year, donate here. View our full voyage schedule for 2017, and have a look at the 10-day St Kilda trip here. 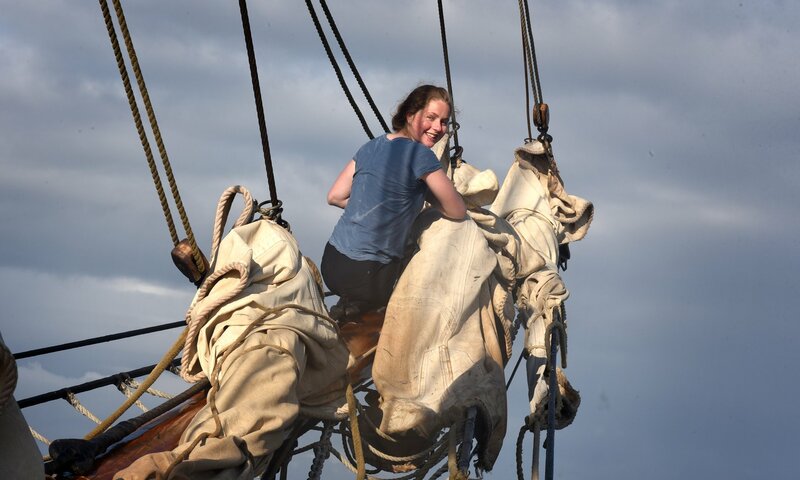 A few years ago, while accompanying the sail cargo ship Tres Hombres into Falmouth with her cargo of rum, I was lucky enough to meet Emily Penn and hear about her impressive work. Emily is an advocate for the oceans, as well as a skipper, artist and international speaker, who is focused on studying various environmental challenges in remote parts of our planet. It was her awe inspiring ‘Exxpedition’ project which pushed me to really think about the bathroom products we use on Bessie Ellen and the impact they ultimately have on the ocean. For those of you who may not be aware, ‘Exxpedition’ is a series of all woman voyages to ‘make the unseen, seen’. In other words, to raise awareness about the impact of plastics and toxins on our oceans, which sadly, are literally swimming in plastic. Plastic doesn’t just go away by itself, it takes an incredibly long time to break down and as it is doing so, causes so much harm to a plethora of animals and the environment in which they live. With this in mind, I began to educate myself more about microbeads, which was becoming a popular buzzword in the media. Microbeads are tiny pieces of plastic which are found in an extortionate number of hygiene and bathroom products – anything from your favourite minty toothpaste to your smoothing hair conditioner could contain these little nasties. With the UK government now under pressure to follow in the footsteps of America and Canada and totally ban them, now is the time to investigate what is in our bathroom cabinet and the impact it is having – not only on the environment, but also on our health. I could go on but for those of you interested in reading a little bit more, do check out this Greenpeace feature on microbeads and discover the excellent work being undertaken by the ‘Exxpedition’ ladies. All of the above truly resonated with me and I am thrilled to announce that this year we have teamed up with Elixir Health, a family owned business in my local town of Wadebridge, to supply all our customers with pollutant free, natural ‘Jason’ products. These will now be the only products that guests will be able to use whilst on board Bessie Ellen to ensure that all she leaves in her wake are waves and memories. A voyage on Bessie Ellen is about so much more than the ship and destination. We have a fabulous crew who help to ensure your time with us is truly memorable. With this in mind, we would like you to meet them all, starting with Adriaan de Vries, mate. Adriaan joins us after completing his Captains ticket at Enkhuisen seafarers school in the Netherlands. Adriaan was thrown into small boats from an early age, learning the hard way but perhaps also the fastest! Then, after completing his education, he became a cucumber farmer, sailing when he could at weekends. At the age of 15, he felt the call of the sea again having met the sail cargo brigantine ‘Tres Hombres’. Fully inspired, Adriaan worked extra hard and saved enough money to spend a year aboard as crew sailing to the Dominican Republic to bring a cargo of rum back to Europe. After crossing the Atlantic twice on a ship with no engine, he ended up in Cornwall for a summer season working for Square sail on board “Phoenix” making a guest appearance in Poldark then going on to fish for oysters under sail in the Fal Estuary over a winter. Before he signed up for navigation school, he asked to be employed as mate this season. He brings good dutch humour, a wealth of rigging skills and pancakes – to our ship. Sarah Whitehead, journalist for The Guardian, recently spent two nights with us on our Tall Ship Taster weekend in Cornwall. In her article she recounts her time on board Bessie Ellen which began with a bit of a battering from storm Katie. After several successful voyages to the Islay Music and Malt Festival the tall ship Bessie Ellen has again scheduled a trip to coincide with the 2016 event commencing 21st May until 29th May 2016. 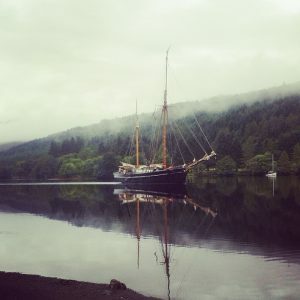 This year Nikki the Captain and owner would like to extend a warm welcome to your Whisky club and invite members to come aboard and get hands on sailing a traditional sailing ship as well as sampling some of the best Island malts made. 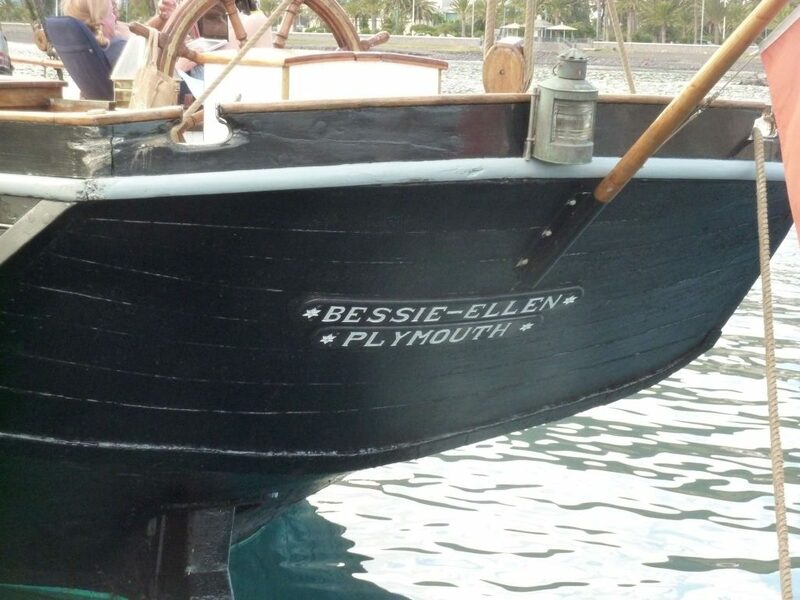 Join your ship Bessie Ellen 16.00 Oban North pier. After a Highland tea set sail for Loch na Cille in the Sound of Jura, passing the famous whirlpool of Coryvreckan. Anchor over night. After a hearty breakfast, visit the mediaeval chapel at Keills to see the remarkable collection of ancient grave slabs within. 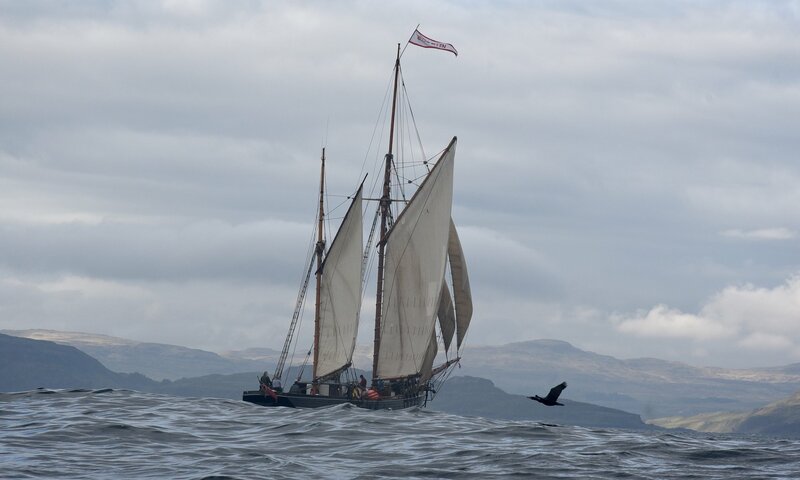 Back aboard help set sails for a gentle sail up the stunning sound of Islay to anchor in Loch Tarbert, Jura. Here you will see seals, red deer, eagles and even wild goats. View the spectacular raised beaches, 15 m above sea level that remain after 10,000 years. Dinner will be at anchor, along with a whisky tasting later on. A short sail to Port Bunnahabain on Islay for the Caol Ila open day. Local music, oyster stands and of course the definitive Caolo Ila tasting tours throughout the day. For those that still have the energy, a taxi will take you to the Ceilidh where local dancers perform reels, tales from the Isle and you can join in and Scottish dance the night away in Port Ellen’s Ramsay Hall. 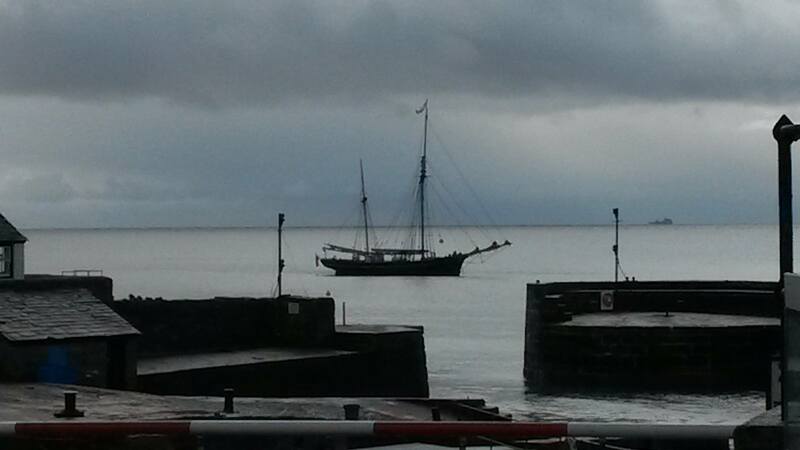 Return to the ship in Port Ellen. A leisurely start to your day, with a choice to sail or walk to Laphroag Distillery. This original distillery produces one of the most peated of all malts, and today is open to the public for tastings along with local music and food. Program to follow. A late evening sail will take you round the East of the Island to anchor at Aros Bay and a traditional dinner of Highland food. Local seafood, venison and a highland whisky dessert will be on the menu tonight. A mid- morning start and leave Islay behind for a day, sailing to Colonsay and Oronsay. Here we hope to see dolphin and Minke whales. The ship will berth at Scalasaig in the evening and there will be a chance to walk over the island to the stunning bay of Kilchatten before returning for a dinner aboard with music and song. Morning tour is booked with Kevin, local island entrepreneur and enthusiast who once owned the hotel here. Colonsay is home to Kiloran Gardens an extensive woodland featuring big-leaved rhododendrons and a wild yet tended feel. In the bay nearby there are the remains of a Viking grave where a skeleton of a man and his horse amongst various artifacts were discovered. On your return, you will join the ship for lunch under sail to visit the small ancient monastery on Oronsay. For those that enjoy foraging, a prawn catching party will try for tonight’s supper. Return to Scalasaig for a pub evening in the hotel with beers and ales produced on the island. Back to Islay and your captains favourite, the Bunnahabain distillery. Today, the distillery manager Andrew Brown talks us through a tasting of 5 specially selected whiskies. You will have a full distillery tour and a chance to buy some of the best and smoothest drams. Sail to Ardbeg. Tonight we treat you to a whisky nosing with whisky experts Eddie and Jo from the Whisky Lounge. 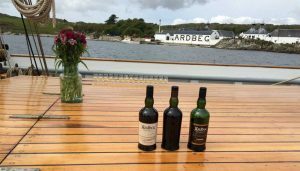 The finale of the Feis Ile today and the whisky of the day is Ardbeg, another heavily peated whisky, but one of the oldest distilleries on the island. Join in the fun and games and tonight you get the opportunity to win a Bowmore Tempest single malt aboard the Bessie Ellen. Your final morning aboard your ship. Disembark from 10.00 at Port Ellen. You may return from either Port Askaig by ferry to Oban, Port Ellen for Kennacraig or alternatively fly from Islay to Glasgow direct. The Captain and crew wish you bon voyage. Every year, Bessie Ellen is hauled out to Polruan Shipyard near Fowey for all the work that is needed to keep her afloat and in survey. Paul Toms, 4th generation ship builder now runs this charming yard right in the heart of this picturesque Cornish village. 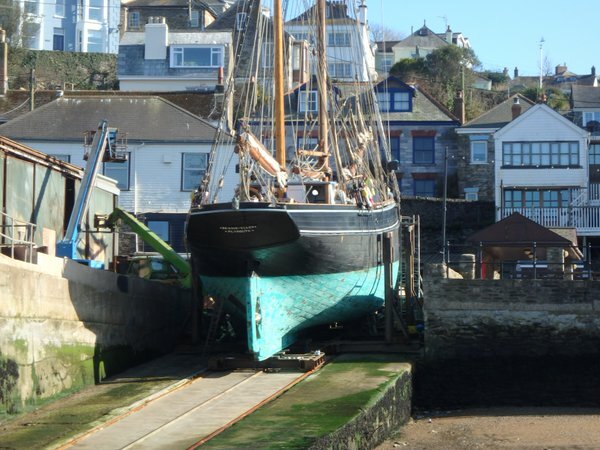 C. Toms & Son’s own story is just part of a long history of boatyards in Polruan, and we are pleased to be able to share some of the history of ship building in the village written for us by Maritime Historian, Dr Helen Doe. “If you look at Toms yard today, you are looking at a site that has built and repaired ships and boats for centuries. Today’s craftsmen follow a long, long line of skilled shipwrights. In the medieval period, ships from Polruan included the Edward that was involved in the wine trade with Bordeaux and was also known to take to piracy on occasions. This was a large ship and she was described in 1433 as carrying over 200 men ‘armed and arrayed for war’. There is little to say exactly where such ships were built or by whom and it was not until the 1700s that a little more information could be gleaned. What we do know is that the site where Toms’ yard is now has been a shipbuilding site for a very long time and it can definitely be traced to William Geach & Son. They were certainly operating there from 1789 and were probably based there well before this date. They built sloops and schooners, the largest being 93-ton Mary in 1824. William Geach & Son went bankrupt in 1836 and the site was idle for a while. At some stage Butson arrived and set up his business there, later moving upriver to Brazen Island. It is almost impossible to find out exactly where ships were built as information is limited. Another shipbuilder in Polruan was Christopher Slade, who may have been an apprentice to either Geach or Butson. Slade’s first yard was below West Street and he operated there from 1841. When Butson moved to Brazen Island, Slade moved into the yard below East Street but retained his West Street yard and also leased a second yard further along West Street (this yard had originally been leased by Marks & Rendle until 1840s). The Slade family of shipbuilders remained on the site below East Street until the Second World War. Bringing Helen’s history up to date, in 1922, Charlie Toms started his business working in a blacksmiths shop near the dock at Newquay. Over the years, he and his son Jack grew C. Toms & Son and took over the whole of the Newquay yard, using John Edward Hocken’s old sail loft as their offices. Meanwhile Daphne du Maurier purchased the boatyard below East Street in 1943 from the business partner of Thomas Slade and the Hunkin family ran the yard on her behalf. Later in 1968, Ms du Maurier sold this yard to Jack Toms and his wife and in 1987, the beach between the East Street yard and Newquay was filled in to achieve the larger premises you can see today. On Easter weekend, Bessie Ellen and the crew will be sailing into Sutton Harbour in Plymouth, helping to launch a new eco-friendly initiative by one of Plymouth’s newest eateries, The Hidden Olive. Returning to a traditional method of importation, we’ll be the first of three historic tall ships to deliver produce from all over the world, carrying premium Caribbean rum and chocolates, paprika and several Spanish products right to The Hidden Olive’s kitchen door. This is not only a sustainable method of transporting food but also gives out zero emissions, reducing the carbon footprint – something the crew and I feel very strongly about. We’re no strangers to Sutton Harbour – we visited last year during Plymouth Pirate Weekend and really enjoyed meeting the visitors, and this time will be that bit extra special to us as we’ll have a chance to catch up with the owner of The Hidden Olive, Sam Bagshawe, who sailed with us for four years and we miss very much. We’re so excited to see that he’s integrated the Bessie Ellen’s history into his new business though! If you’re in or around Plymouth between 25th and 28th March and would like to take a look at Britain’s last wooden trading ketch, please come and say hello, and why not pop into The Hidden Olive for a delicious bite to eat? We certainly will be! We’re proud to support the INSPIRE Foundation, a unique national charity that’s dedicated to raising money for research, practical solutions and ultimately to improve the quality of life for those with Spinal Cord Injury – some 40,000 people in the UK alone. Why have we chosen INSPIRE? Quite simply, it came about chatting away during a long night watch with our Bosun James Steevenson about what our assorted families were up to. 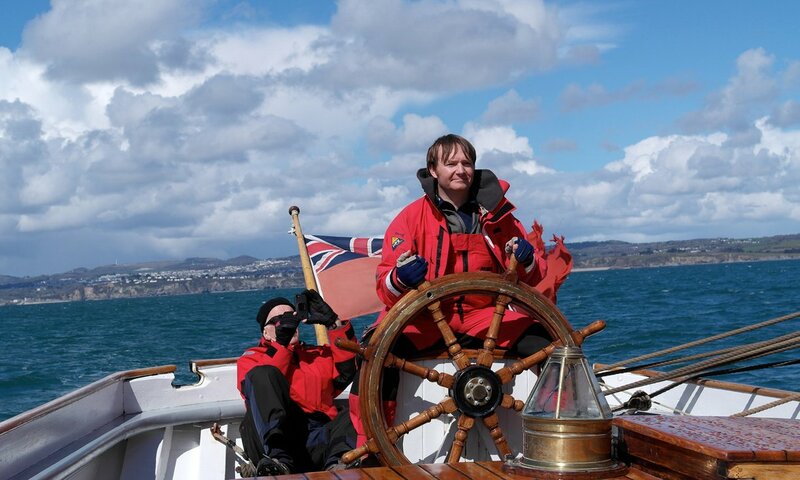 James is on board to gain experience and hands on training before continuing towards a career in the sailing industry and is doing superbly well in all fields. We’ll be sad to say goodbye to him in June when he continues on with his maritime training. James’ father, Rory was selected as Executive Director of the INSPIRE Foundation in September 2012. He is Secretary to the Trustees, responsible for all fund raising and coordinates all research projects with the National Scientific Committee in the major teaching hospitals and medical schools throughout UK. On leaving the Army he fulfilled a lifetime’s ambition rebuilding his 27 foot yacht now moored in Keyhaven near Lymington and furthered his interest in voluntary charity work. Rory has two student sons Bill (23) and James (22) and his main interests are cooking, DIY, sailing, skiing and country pursuits. He is a member of the RNLI and a Trustee of the Royal Hampshire Regiment. One of the charity’s main fundraising events takes place at the Royal Navy vs. Army Polo Tournament held at Tedworth Park, near Andover, every summer. A packed day of celebrity polo matches, a two-furlong dash, a wheelchair relay and a three course lunch, it culminates in a fundraising auction, in which we’re pleased to offer the ‘Bessie Ellen Experience’ to the highest bidder – a week’s sailing on board Bessie Ellen, or a bespoke corporate day for 12 passengers to fit in with the ship’s itinerary.